Virtual Reality Is Now a Marketing Reality #infographic ~ Visualistan '+g+"
Once an out-of-reach technology, VR is now an out-of-the-box technology—accessible by consumers and brands alike. From Oculus Rift to smartphone-powered headsets, anyone can immerse themselves and others into a virtual world. Marketers, who are responsible for driving the customer experience, stand to make huge gains with VR campaigns. In fact, 30% of Forbes Global 2000 consumer-facing companies will experiment with augmented and virtual reality this year. But if you’re a B2B organization, don’t write yourself off just yet. All brands can partake. 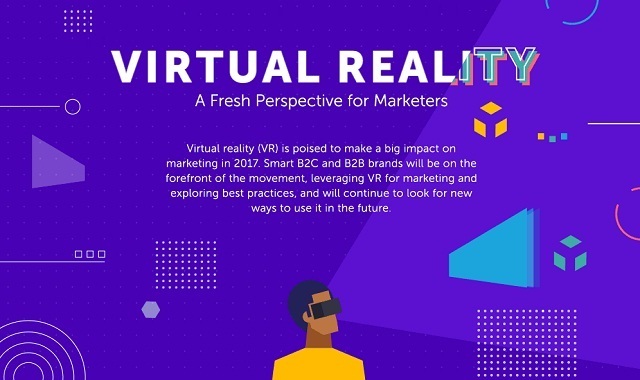 To drive the power of virtual reality home, Marketo has created this gifographic Virtual Reality: A Fresh Perspective for Marketers to show you the difference a more immersive experience can make.